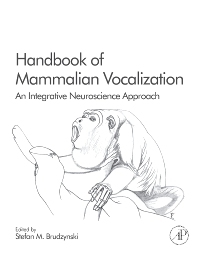 Handbook of Mammalian Vocalization is designed as a broad and comprehensive, but well-balanced book, written from the neuroscience point of view in the broad sense of this term. This well-illustrated Handbook pays particular attention to systematically organized details but also to the explanatory style of the text and internal cohesiveness of the content, so the successive chapters gradually develop a consistent story without losing the inherent complexity. Studies from many species are included, however rodents dominate, as most of the brain investigations were done on these species. The leading idea of the Handbook is that vocalizations evolved as highly adaptive specific signals, which are selectively picked up by the brain. The brain serves as a receptor and behavioural amplifier. Brain systems will be described, which allow vocal signals rapidly changing the entire state of the organism and trigger vital biological responses, usually also with accompanying emission of vocalizations. Integrative brain functions leading to vocal outcome will be described, along with the vocalization generators and motor output to larynx and other supportive motor subsystems. The last sections of the Handbook explains bioacoustic structure of vocalizations, present understanding of information coding, and origins of the complex semiotic/ semantic content of vocalizations in social mammals. The Handbook is a major source of information for professionals from many fields, with a neuroscience approach as a common denominator. The handbook provides consistent and unified understanding of all major aspects of vocalization in a monographic manner, and at the same time, gives an encyclopaedic overview of major topics associated with vocalization from molecular/ cellular level to behavior and cognitive processing. It is written in a strictly scientific way but clear enough to serve not only for specialized researchers in different fields of neuroscience but also for academic teachers of neuroscience, including behavioural neuroscience, affective neuroscience, clinical neuroscience, neuroethology, biopsychology, neurolingusitics, speech pathology, and other related fields, and also for research fellows, graduate and other advanced students, who widely need such a source publication.